A Short, Sharp Shock is a novella that was first published in 1990 in collections. It was published as a stand-alone volume in 1996. It follows the amnesiac protagonist as he wakes up on a moonlit shore. 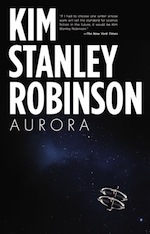 It is one of Robinson's rare forays in the genres of fantasy; unlike most of his work, it is not science fiction. The protagonist wakes half-drowned on a beach, along with a beautiful woman he does not know. He sleeps, only to find the woman gone when he awakes. He has no memory of his life, does not know his name, and does not know how he wound up on the beach of a world that seems quite alien to him. An old native woman, one of the fisherfolk, informs him that the woman who was with him the previous night on the beach has been taken by a fierce group of natives known as the spine kings. She feeds the nameless protagonist and tells him where the spine kings will be setting camp, Kataptron Cove, and the journey begins. The protagonist discovers that the landmass he has been washed up on is a long narrow peninsula. Along the way to the Kataptron Cove, the protagonist meets a group of natives who are also headed to the cove in order to rescue some of their kin from the spine kings. The treefolk have miniature fruit-bearing trees that grow from their shoulders, and invite the protagonist to join them in their morning ritual. Julo, the leader of the treefolk, gives the protagonist the name "Thel" upon learning that he cannot remember his name. As Thel has nothing to eat, Julo tells Garth, another member of the treefolk, to feed him from the fruit of Garth's shoulder tree. They travel together to Kataptron Cove, and Julo tells Thel the treefolk's creation story for the world, the first of numerous cosmogonies that Thel will hear throughout the novel. Upon arriving at the cove, the party witnesses the sacrifice of captives by the spine kings, and they wait until dark to free the other prisoners. Among the prisoners they free is Tinou, who guides them back to the peninsular path as they flee. Also freed and joining the group are three facewomen, who have a recursively smaller series of faces in place of their right eyes. Tinou has takn a golden mirror from the spine kings, and believes the spine kings will pursue them in order to retrieve it. As they continue westward along the peninsula, they reach the town of Oia, which is Tinou's home, where they hold a celebration and feast to mark the return of Tinou and the mirror. While at Oia, Thel and the swimmers witness Tinou chnage from male to female and back again, and Thel hears the Oia sorcerers tell their story of the creation of the world. As the spine kings approach Oia, Tinou and the other sorcerers grab Thel and force his body through the surface of the golden mirror, which has become a sort of portal. Once Thel is through the mirror, Thel encounters Tinou again, but in a different personage who is called Naousa. As Naousa, Tinou rescues Thel from the pursuing spine kings by showing him how to sled down a steep part of the spine, after which they take different paths. Thel walks along the beach, only to sink into quicksand. Thel awakes to find himself reuinted with Garth and the swimmer, and the three facewomen, who escaped from Oia and the spine kings during the attack, carrying a comtose Thel and the mirror. While Thel was on the other side sledding with Nasou, the others infomr him that he was also awake and leading them to safety. They eventually succeeded in pushing Thel through the mirror, which caused his return to their side of the mirror. Eventually they reach the village of the facewomen who welcome the travelers but inform them they are still being pursued by the spine kings, as they have observed through their telescope. They offer the group horses to carry them along, and before they leave one of the facewomen observes Thel through the telescope, through which she can see into Thel's past. She relates a moment when Thel, as a child, fell from a cliff into a lake, and announces that while he was submerged he glimpsed the future that he is experiencing now. The next day Garth, Thel, and the swimmer depart on horseback. After many days, the food is depleted, and Garth feeds the swimmer and Thel from the fruit of his shoulder tree. Eventually they reach the brough, a section of the peninsula which is passable only during the low tide, and they release the horses to return to the facewomen and continue on foot. As they approach the brough and contemplate how they will cross, they meet Birsay, a guide who will help them across the brough. Since the distance to be covered is more than can be traveled in a day, Birsay explains that the process of crossing requires the travelers to travel halfway, then anchor themselves to the rock as high tide comes in, where they will float through the high tide until the water recedes again permitting travel. They wait for the low tide, then travel to the halfway point with Birsay. While they are anchored at the midpoint, a violent storm materializes, and pummels the anchored travelers through the night. When the water finally recedes, Thel finds Garth and the swimmer missing, and Birsay the guide drowned. Distraught, Thel hurries across the remainder of the brough, hoping that the swimmer and Garth were able to weather the storm and find their way to the opposite shore. Thel wanders for many days searching for Garth and the swimmer, to no avail, eventually giving up. He continues west along the peninsula until he reaches an odd ridge of rock extending perpendicularly to the main spine. At the point where the ridge meets the peninsula are the ruins of an old fort, and a small band of villagers, the crofters, who inform Thel that at the other end of the ridge is a temple. Thel sets out on across the ridge, and after ten days journey comes to the end, and uses this vantage point to observe the midday shadow and determine that it would take 200 years to circumnavigate the globe on foot. Thel returns to the peninsula and once again heads west, where he shortly comes to the village of Olimbos which is in the midst of a New Year's celebration. Thel is seduced by Khora, the queen of Olimbos, and stays in the village as the queen's lover. As time goes on, the queen becomes increasingly abusive towards Thel, but he remains with her, and eventually she tells him yet another creation story. One night the swimmer appears at the village and Thel runs off with her. They travel for several weeks, during which time the swimmer tells Thel how she managed to survive the storm at the brough and how she has been searching for him. They eventually arrive at the village of the shellfolk, whose houses are constructed from large nautilus shells. They are given a shell of their own to stay in, provided they collect small blue seashells from the beach, which are sought after by the shellfolk. Thel and the swimmer learn that the shellfolk, which are divided by their skin color into purple and brown, are constantly arguing, so one day they move their shell to the outskirts of the village where they can reside more peacefully. They are befriended by Psara, one of the village elders. They wind up staying with the shellfolk for a long time, and one night they are told another creation story. Later, while searching for shells, Thel finds a coin in the surf, which appears to have the swimmers profile upon it. They stay on at the village for several years, and one night during a birthday celebration for one of the elders, Psara is revealed to be Tinou. Tinou pushes the swimmer through the mirror, and Thel dives through the mirror after her. When they awake in the mirror-world, they pursue Tinou and the mirror for many days, fighting pain and increasing hunger. They notice that they are slowly transforming; Thel into a monkey-like being, and the swimmer into a otter-like being. They finally catch Tinou and kill him, regaining control of the mirror. They continue on, continuing their transformation, until one day they reach the end of the peninsula. Setting up the mirror at the edge, the wait until sunset, and jump through the mirror together one last time. The story is exclusively told from Thel's point of view. The main character of the story, who awakes on the strange peninsular world with no real memories of his identity. Thel is given his name by the leader of the treefolk, Julo, who claims that Thel means "treeless". He travels the peninsular world, first in an effort to rescue the swimmer, and then fleeing various groups, with the swimmer and sometimes other natives as companions. He makes several trips through the mirror, an object which seemingly transports him to alternative mirror-world versions of the peninsula. For a period he lives with Khora, the queen of Olimbos, as her sexual partner, until he reconnects with the swimmer and leaves with her. Afterwards they live together with the shellfolk, until Tinou appears in the guise of one of the shellfolk and forces the swimmer through the mirror; Thel jumps through the mirror to follow her. On the other side of the mirror they chase Tinou, while Thel is slowly transformed into a baboon-like creature. They finally catch Tinou and kill him, once again coming into possession of the mirror. As the final act of the story, Thel and the swimmer jump through the mirror one last time after reaching the end of the peninsula. While visiting the different villages on the peninsula, each one tells him their version of their creation story, which typically sparks some intimation of Thel's life before he arrived on the Peninsula. We learn that Thel likely came from a different world, and that he may have studied geology, but never learn more than hints as to his life before the story begins. Never given a name, the swimmer is a woman that washes onto shore with Thel at the beginning of the story. Traded to the spine kings by the fisherfolk, she is rescued by Thel at Kapatron Cove, and they continue to travel together. They are separated while attempting to cross the brough, but eventually cross paths again at the village of Olimbos, where the swimmer's arrival frees Thel from Khora's spell. She and Thel take up residence with the shell folk for several years, but she is eventually forced through the mirror by Tinou, and Thel follows her into the mirror-world. While in the mirror-world the swimmer is transformed into an otter-like creature, and she and Thel hunt down Tinou and gain possession of the mirror. As the final act of the story, she and Thel jump through the mirror one last time after reaching the end of the peninsula. A member of the treefolk, Garth is held in lesser esteem since his shoulder tree grows from the right shoulder rather than the left as is typical. We are told that Garth means "righttree" in the treefolk language. Garth stays with Thel at Kapatron Cove and helps to free the prisoners of the spine kings, then journeys with Thel and the swimmer as they flee from the sorcerers of Oia, using the fruit from his shoulder tree to feed them. He is presumably drowned with Birsay while attempting to cross the brough. One of the sorcerers of Oia, Tinou is rescued from the spine kings at Kapatron Cove by Thel and Garth. He recovered the golden mirror, and returned it to Oia, where he eventually forces Thel through the mirror for the first time. Once Thel is through the mirror, Thel encounters Tinou again, but in a different personage who is called Naousa, who rescues Thel from the pursuing spine kings by showing him how to sled down a steep part of the spine. Tinou later returns as Psara, one of the shellfolk, and forces the swimmer and Thel through the mirror again. On the other side he is pursued by Thel and the swimmer, and he is eventually killed and eaten by them. This opus is a piece of surrealist fantasy, one-of-a-kind in Robinson's work. There are many references to Greece and the Cyclades, especially Santorini, in the general geography of the spine and in the names of places and characters. Robinson visited Greece (Santorini and Crete in particular) in 1985. 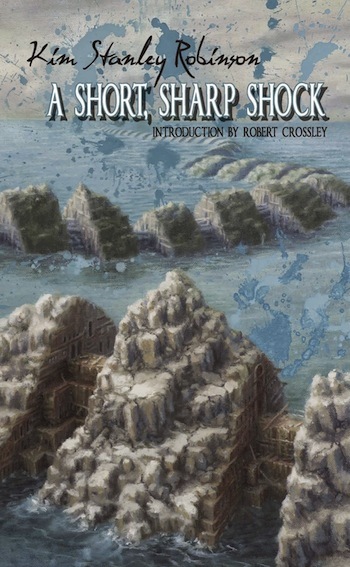 "I think of my novella "A Short Sharp Shock" as being my fantasy novel. I kept it short because for me, even in the fantasies I love, I get weary near the end... a matter of "where anything can happen nothing is interesting" which is the GREAT danger of fantasy generally. You have to somehow counteract that by convincing readers that there are rules in the fictional world, explainable even if magic, so it's not a case of anything can happen. Now in "A Short Sharp Shock" I have a very fluid, surreal situation, like a science fantasy five million years in the future, with lots of unexplained and unexplainable phenomena, so I needed to make it short I thought. But I put everything I had into that story, and I'm very proud of it. I would love it if it eventually joined the fantasy or science-fantasy canon, as something to read, like MacDonald's Lilith or Lindsay's "A Voyage to Arcturus," two weirdo fantasies I love." A surrealist science fantasy, written right after my first son was born in a state of sleep deprivation. I wrote it partly because I knew I’d be writing this huge realistic trilogy. The version of the text published in Asimov's Science Fiction Magazine is shorter than other versions. Several sections are omitted, the largest being the portion of the story involving Thel's stay in Olimbos with Khora; also missing is Thel's detour along the ridge that sits perpendicular to the spine to determine the size of the world, and the scene where Thel finds the coin with the swimmer's image on it. But the sun moved, and time passed nevertheless. Sitting in the shorebreak and watching his lover roll back and forth like beautifully rounded driftwood, Thel couldn’t help thinking of that, from time to time; of time passing: and he wished he could be a man of bronze, unchanging, living the same day over and over. He would have chosen that day. He sat on the beach watching the clouds tumble overhead and letting handfuls of sand run through his fingers, the little clear grains of quartz, flecks of black mica, pieces of coral, shell fragments like small bits of hard ceramic, and he saw that a substantial portion of the sand was made of shells, that living things had labored all their lives to create ceramic shelters, homes, the most permanent parts of themselves; which had then been pummeled into shards just big enough to see, millions upon millions of lives ground up and strewn under him, the beach made out of the wreckage of generations. And before long he and the swimmer too would become no more than sand on a beach; and they would never really have understood anything.